• His idol: Late major champion Seve Ballesteros, who also is from Spain. • Achievements: Led NCAA in birdies (165) and eagles (9) as a freshman and in eagles (12) as a sophomore. Pac-12 Freshman of the Year. 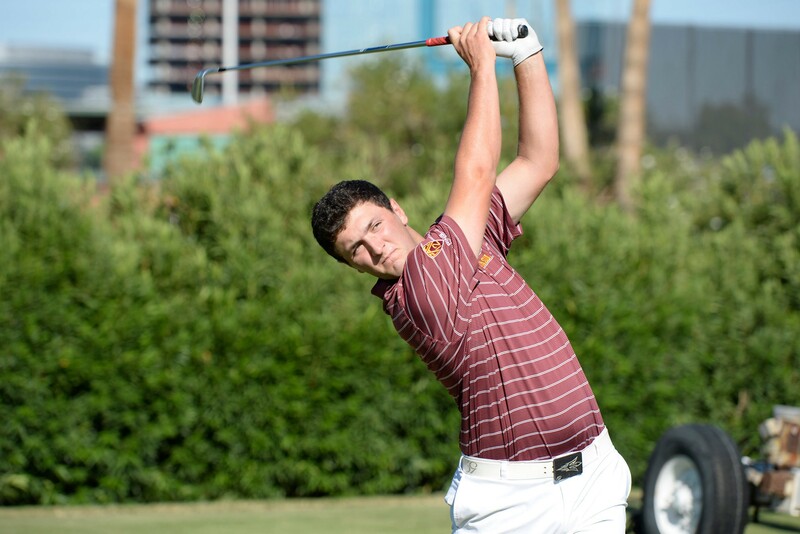 TEMPE – After breaking a 54-year-old record held by Jack Nicklaus and being congratulated by the Golden Bear himself via Twitter, Jon Rahm is expected to shoulder the load for the Arizona State University men’s golf team when its season begins Sept. 29. “Everyone keeps asking me what it felt like to be congratulated by Jack Nicklaus and I still don’t know what to tell them, except that it was probably the best I’ve ever felt in my life,” Rahm said. The junior from Barrika, Spain, broke Nicklaus’s event record after shooting a 70-64-62-67 for a 23-under 263 at the World Amateur Team Championships in Japan on Sept. 13. The PGA’s all-time leader in major championships tweeted a shoutout moments later. “I bet Jack Nicklaus doesn’t even know what I look like, but just to hear from him on social media was amazing,” he said. Rahm’s dream of being recognized by the best may come true at some point, but until then he and his teammates are hoping to surprise a Pac-12 conference that sent two of the final eight teams to the 2014 NCAA championships and has six teams ranked in the coaches’ preseason top-25 poll. ASU didn’t land in top 25, but head coach Tim Mickelson said Rahm can push the team higher. Mickelson also said the team would depend on Rahm, a 2014 PING All-American, even more this year after finishing sixth in the conference and failing to qualify for the NCAA tournament last season. If he winds up carrying the team, Rahm’s back should feel nice and loose. The team’s training regimen underwent a drastic change in the offseason that he and other players are praising. The team’s new training program is based on the exercises of the Titleist Performance Institute, an organization that researches how the human body functions in relation to a golf swing. Jon Rahm is expected to shoulder the load for the Arizona State University men’s golf team when its season begins Sept. 29.